HomeWhat am I learning? How is it going? What am I going to do next? What am I learning? How is it going? What am I going to do next? Teams are currently setting 2016 learning targets and I have been reading some of the targets set with interest because cognitive applied language proficiency plays an important part in achieving these targets. The year 3 & 4 teachers regularly see a fall in data and often I often hear discussion around the ‘why’. From my previous work as a Ministry of Education verifier I know that reading, writing and mathematics should be reasonably aligned. When I see several sub levels between the two I know straight away that some of the data pieces are incorrect. Also if earlier school data is not maintained then that earlier data has been gathered using student’s basic interpersonal skills. When they reach years 3 and 4, cognitive applied language proficiency becomes the learning norm and often our ELL children have just not YET achieved that in their second language of English. I keep reminding our teachers at Newmarket School of the chart from Thomas and Collier, 1997 that shows children learning English as a second language (L2). 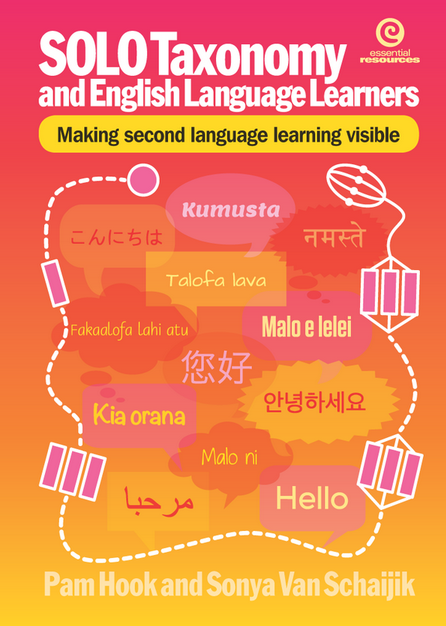 The chart shows the process from early production to advanced fluency can take from 5 to 7 years depending on their literacy levels in their home language. The best outcome is when children are able to learn through the curriculum in both languages or through full bilingual education. The challenge can be schools who believe that English only is the pathway for academic success and actively dissuade teachers and children from using their first language. There is a common belief that by immersing the learner in English only will accelerate the learner in their second language. However the longitudinal research proves otherwise. That red thin line falling is one I see regularly. The children often appear too high too soon in the early years. Then we see the fall and this usually happens after 3 to 4 years at school. What we should see is a gradual improvement with a goal of meeting benchmark by year 6. Then if that happens the children have a much better outcome in their following years. I also regularly look at this chart to remind myself that the most effective way of learning English is in class and not necessarily when the children are withdrawn for specialist intervention. Finland have this strategy nailed when a second teacher is placed in the class to support with intervention. Notice I said teacher and not teacher support. Most of our ELL children at Newmarket School learn in class with teacher support because that is where we are generally as an education system. We have some learners withdrawn for reading recovery, some for steps and some for intensive support with me if the children come from several classes and have similar literacy needs. Previously we have had other forms of literacy support, especially as we unpack our data against National Standards. However the data I would be particularly interested in is when our children leave Newmarket School and what happens to them particularly at NCEA level 1 & 2. I look forward to seeing this happen because our school is part of the Community of Schools for 2016. Our teachers at Newmarket School have asked for professional learning using SOLO taxonomy to advance writing. All our teams have set this as an inquiry goal for 2016 because our writing data continually appears mismatched against reading and mathematics. In additions some teams will work with emergent learners and have learning support with other students. This will take place in class and I am excited at seeing this change in teacher thinking. Myself I believe our writing data is the most realistic data and regularly remind our staff of our school’s student makeup. In April 2015, Newmarket school had 263 students on the school roll. 86 ESOL funded in the 2015 A round of funding. 74.60% of our children come from homes with another language spoken. Just under half of these are ESOL funded at 24.6% of the school roll. Currently we have 21 different languages at home. Our total Asian group has nearly doubled in the last 7 years from 43% in 2007 to currently 61.5% of our school role. Our biggest ethnic group is Chinese children who make up 28.2% of our school role. What is SOLO Taxonomy? SOLO is the Sustained Observation of Learning Outcomes. I was first introduced to this learning framework during my TESSOL diploma in 1997. I selected to present the work of Biggs and Collier during one of my earliest assignments. We had to present our learning in 5 minutes. A decade later I joined Newmarket School and the school was in the second year of an ICTPD contract with Pam Hook. I was incredibly lucky in my second year to oversee the contract therefore was able to have extra learning time with Pam Hook. My understanding of SOLO became embedded in my practice. My earlier attempts at SOLO highlighted that I often focussed on the product and the outcomes of my students and gave little attention to the process. I believe that this has changed as I regularly step through the learning process with the children and have made this process visible. This year, Pam Hook and I wrote SOLO Taxonomy English Language Learners, Making second language learning visible. Our book is now in the last stage before publishing. I have been working alongside Pam for several years and she has been an amazing educator mentor for me. I think she just understands what I say and mean and regularly helps me clarify my thinking by asking probing questions. Several years ago, Pam suggested that we write a book together framed with SOLO and I baulked at the idea because I felt my learning with SOLO Taxonomy was in early stages. However last year after Ginny and I had presented to a school who were asking how to use SOLO with second language learners, I decided that I was on track and went back to Pam and said I felt I was ready. Ginny pushes my pedagogy and is often quite straightforward in her honest feedback. She sometimes pulls me back in my thinking because I have missed a building block and highlights where I need to address the gap. With that seed in mind, I began collecting artefacts that could be suitable. This year I fine tuned an idea about making the writing key words visible using colours. Before that I had the children highlighting words with whatever coloured felts that were available and were not dried out. My thinking wall was usually just a jumble of words hand scribbled on cut out cards as I clarified my thinking. I am one of those teachers who puts something up and by looking at it daily, I can see where I need to develop or see what I still need to do. So my walls have been a hive of activity. Some school terms have seen better wall displays than others. My learning this year around teaching writing has been immense. My own writing has also developed and I have blogged much more. Teachers if you are reading this, bear the following in mind. If you want to teach writing and get results with writing then understand your own learning with writing. I am really clear with description, explanation, sequencing, analogy, part whole thinking and classifying. I can now see how to get to extended abstract thinking in SOLO Taxonomy and I can see the vocabulary that is required for this deeper thinking. This year I was hoping to nail extended abstract thinking. However on reflection I know that my own writing was still developing and currently sits mostly at relational thinking. Every so often I write something amazing and I hope to do so much more of that next year. I created a list of words that help make writing visible against SOLO Taxonomy. Over the past few years this idea has grown and I have tested it out with my writers. This year I colour coordinated the list. and constantly used the same colours for the same key ideas and it has worked. Next year our teachers will be using similar ideas as they continue to unpack writing framed with SOLO Taxonomy. They will make writing visible and the best way that I have found to do this is using consistent colours. So if you are interested in writing and want access to this writing vocabulary list framed using SOLO Taxonomy then very soon our book will be available and this list is part of the package. If you want to know more about how I have unpacked my learning using SOLO Taxonomy and English Language Learners then again this book would be an ideal addition to your staff bookshelf. Finally if you have high numbers of ELL students then again you will find this book of interest and value. In addition next year Bridget Casse and myself are running a TeachMeetNZ meets SOLO Taxonomy session. I am super excited because Pam said she will also be involved. I will share the year I have had making my learning visible. I have convinced Virginia @ginnynz01 to be part of this Teachmeetnz. Over the next few weeks, our SOLO Taxonomy list of presenters will be available as we confirm presenters. The confirmed date is Saturday 16th of April at 2.00pm. Follow me on twitter @vanschaijik and also Bridget @BridgetCasse. You can also watch Pam ‘s feed too @arti_choke. The hashtag is #TeachMeetNZ.